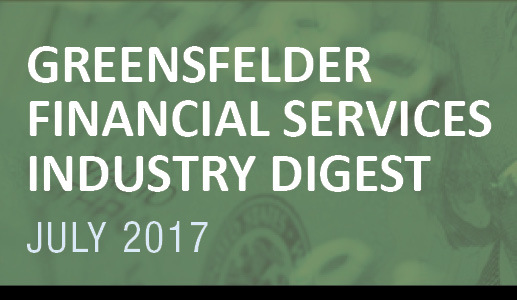 On June 1, the SEC requested comment on whether to impose a fiduciary standard on broker-dealers. Read our summary here. The next day, Nevada Gov. Brian Sandoval signed a bill imposing a fiduciary standard on brokers in that state. Read more here. On June 6, the Department of Labor filed its request for information related to the fiduciary rule with the Office of Management and Budget; it is pending review. Parts of the DOL fiduciary rule became effective June 9. Read our previous summaries here and here. The CFP Board released its draft Code of Ethics and Standards of Conduct, which would require CFP professionals to act in a fiduciary capacity any time they offered financial advice, instead of only when they create financial plans. In Lucia v. SEC, the D.C. Circuit denied a petition for review in which the underlying issue is the constitutionality of the SEC-appointed administrative law judges when the court deadlocked 5 to 5. The decision leaves in place a 2016 opinion from the court in which the court denied Lucia’s petition for review of the SEC’s decision. The legal question is whether SEC ALJs are employees or officers who must be appointed in accordance with the Appointments Clause under Article 2 of the US Constitution. The Lucia decision conflicts with Bandimere v. SEC in the Tenth Circuit, increasing the chances that the Supreme Court will weigh in to resolve this circuit split. He also testified in the House regarding the Commission’s budget. His remarks highlighted the agency’s increasing use of technology and analytics, which was also the topic of the acting chief economist’s speech in June. New FINRA Chairman: The FINRA Board of Governors unanimously elected as Chairman William H. Heyman, vice chairman and chief investment officer of The Travelers Companies, Inc., effective July 18. FINRA guidance: FINRA CEO Robert Cook gave a speech about protecting investors from bad actors in which he announced that FINRA “intend[s] to reinforce and clarify firms’ existing supervisory obligations concerning brokers they employ that have disciplinary histories” in guidance FINRA will issue soon. The guidance is expected to address both how to identify brokers that pose a higher risk as well as the elements of supervising such brokers. Protecting seniors: NASAA marked World Elder Abuse Awareness Day by releasing a new study on broker-dealer practices and procedures related to senior investors. Read FINRA’s June report of monthly disciplinary actions here. Regulatory Notice 17-14 – As part of the FINRA360 initiative, FINRA is requesting comment on the effectiveness and efficiency of its rules, operations and administrative processes governing broker-dealer activities related to the capital-raising process. Regulatory Notice 17-15 – regarding proposed amendments to FINRA Rule 5110 (Corporate Financing Rule – Underwriting Terms and Arrangements) to make substantive, organizational and terminology changes to the rule intended to modernize and clarify it. Regulatory Notice 17-16 – regarding proposed amendments to FINRA Rule 2241 (Research Analysts and Research Reports) and FINRA Rule 2242 (Debt Research Analysts and Debt Research Reports) to create a limited safe harbor for specified brief, written analysis distributed to eligible institutional investors that comes from sales and trading or principal trading personnel but that may rise to the level of a research report (desk commentary). FINRA also established an Innovation Outreach Initiative to better understand fintech’s impact on the securities industry. FINRA’s Blockchain Symposium on July 13 is part of this initiative. FINRA also issued a Research Note on Securitized-Asset Liquidity.